Thrulife Aviation Marketing through Design Inc. This week’s Farnborough Airshow sees the launch of an all new aviation marketing campaign featuring new branding, website, advertising and email marketing campaigns which have been created over the past few months for STAG Group. The international aviation and defence group comprising Spectech, Comfast, Arnold Wragg and Aircraft Components & Equipment Supplies is a leading aviation spares supplier; providing design, manufacture, distribution and services based solutions. 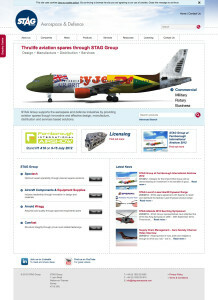 The new home page and exhibition stand featured ‘Thrulife through STAG Group’ campaign uses ‘sliced-up’ airframes (commercial, military, rotary and business aviation) shown in cradle to grave paint schemes. For example from beginnings in assembly line primer through flag carrier, budget carrier, courier airline or training airframe and ending up with boneyard exfoliation and oxidation. This striking and memorable graphic message sets STAG Group apart in terms of brand differentiation and reminds customers that STAG Group provide comprehensive spares solutions throughout and in many cases extending the working life and value of an aircraft asset. Design Inc UK is a West London-based marketing agency. If you’re considering our marketing & creative services for a new aviation marketing campaign, please contact us by calling 01784 410380 or emailing us to find out more.